Pope Francis is coming to Philadelphia, and bar owners aren’t sure whether to prepare for the rapture or purgatory. But one thing is certain: They’ll be serving good beer—no matter what they have to do to get it. One publican is turning the third-floor storage space above the most central of his six taverns into a pop-up walk-in cooler. Another is planning to receive deliveries at his house, where he’ll also have teepees on the back patio for employees to camp out for the night. A third intends to shut down his kitchen and set up an outdoor grill instead, offering char-broiled franks and barbecue to complement pours from his dozen or so taps. Why all this convoluted preparation? Chalk it up to the “traffic box”—a 3-square-mile trapezoid surrounding the center of Philadelphia that will be closed to incoming traffic during the papal visit. Francis’ upcoming visit marks the first time the 266th pontiff will set foot on U.S. soil. He’ll touch down Tuesday in Washington, D.C., and then make his way to New York, with sermons and speeches scheduled in both those cities. 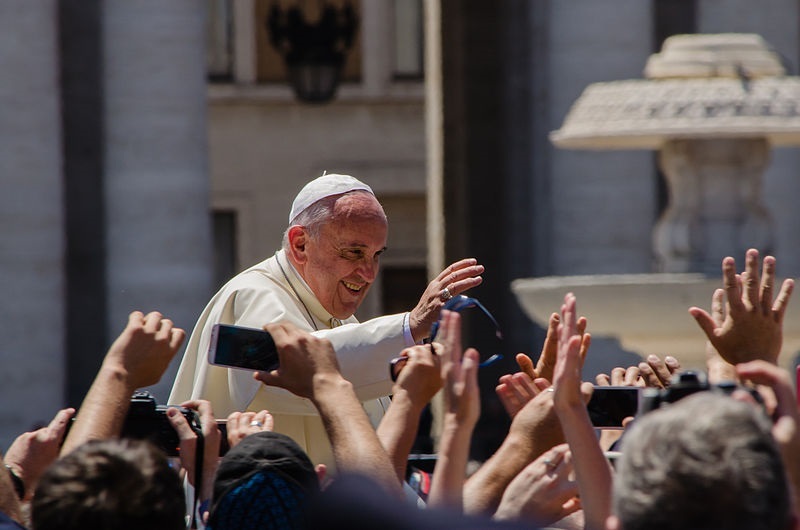 But only in Philly, where the triennial World Meeting of Families is taking place, will Francis conduct an outdoor Mass that’s open to the public, no special invite or entrance fees required. That service will be held on Sept. 27 on Philadelphia’s Ben Franklin Parkway, as will a nonceremonial public address the day prior, and together the events are expected to draw up to 1.5 million people to the city—an influx that would nearly double the city’s population. Since all those tourist-pilgrims will need to eat, and will likely want to drink, the papal visit presents an ostensible chance for restaurants to rake in some extra dough. With one caveat: They have to figure out how to do it without regular deliveries of booze and food. Bar owners are a creative bunch, though, so they’re plowing ahead full force. Fresh seafood is being slashed from menus—you might not be able to order that bowl of mussels to go with your gueuze, for example—and if you’re in the mood for a farm-to-table salad to back up your pilsner, you’ll probably have to wait for another day. But just about everyone is making sure that beer lists will be flush with all the variety Philadelphia’s reputation promises, even if it means back rooms might become labyrinths of keg stacks for a couple of days. That’s good news for all the beer-loving out-of-towners, but there’s also reason for local imbibers to look forward to the visit: the opportunity to taste the eight special beers being brewed in the event’s honor. Nancy and Bill Barton had never before made a Belgian tripel at their brewery in Philly’s Kensington neighborhood, so they decided the monk-inspired challenge was perfect for their papal one-off. They ordered a special Belgian yeast, added it to a mix of barley malts, threw in a lot of Belgian candi sugar and cooked up a 60-barrel batch. The name likely added to the beer’s popularity: It references the onomatopoeic representation for “water” as pronounced with a Philadelphia accent. In addition to the many bars around the city that regularly carry PBC, the special beer will be served at the brewery tasting room, open during pope weekend. YOPO (You Only Pope Once), Cape May Brewing Co. He crammed more than 40 pounds of Citra, Amarillo, Falconer’s Flight and Citra hops into his 15-barrel tank, and the beer emerged with bright citrus and grapefruit notes and an ABV of 5.2%. The young brewery is on track to produce 6,000 barrels this year; its products are already pouring in about 150 bars across Philadelphia, though not all were able to lock in their YOPO orders—Krill is currently brewing a second batch to meet demand. It will also be available at the brewery’s tasting room. Papal Ale, Manayunk Brewing Co.
An honest-to-goodness priest was on hand to bless the hot liquor tank used to brew this limited-edition Belgian amber. Whether or not that had an effect on the final flavor is up for debate, but brewmaster Evan Fritz does remember it as the most seamless brew day he’s ever experienced. His 15-barrel batch started with a grain bill sparked by Special B, a dark caramel malt that imparts notes of dark cherry or plum. As a nod to Francis’ homeland, he added Argentinian sugar, and also tossed several wine barrel staves into the fermenters to impart an oaky aroma. Collectors take note: Papal Pleasure will not be draft-only—a very limited run of 22-ounce bottles will sell for around $11 each at bottle shops around the city. Find the beer on tap at the brewpub, at various pubs in Philadelphia and also at several area hotel bars. Pater Noster, 2nd Story Brewing Co. When he began working out logistics for the papal visit, he realized with a start that there was a style perfectly suited for the occasion: patersbier. Also known as a Belgian single, it’s a low-alcohol brew Trappist monks traditionally made for themselves, in contrast with the high-octane versions sold to the public. To make his, Wible used an Abbey yeast to ferment a malt with 15 percent red wheat, added to boost the brew’s husky character. He pushed fermentation a bit warmer than normal, encouraging the development of fruity esters, and ended up with a 4% beer that carries the flavor of a Belgian, without the booze. Look for it on tap at the brewpub throughout the second half of September. Jesus Wept, Crime & Punishment Brewing Co. When Crime & Punishment opened this summer, it became the first brewery operating in Philadelphia’s Brewerytown since Prohibition. It’s been popular from the start, and the tasting room, which serves food, will most definitely be open during the papal visit—possibly even with extended hours. One of the taps will be pouring a specially brewed gose named Jesus Wept. To make it, principal brewer Mike Wambolt and his partners will be creating a mash of 100 percent German wheat malt on the seven-barrel system tucked into the back of the narrow space. They’ll add the traditional sea salt and coriander, and kettle-sour the beer for 36 hours to provide the lactic acid that gives a gose its tart undertone. It will debut on Friday, Sept. 25. Head brewer Chris LaPierre was giving his staff a lesson on Trappist beers when something clicked—a Belgian single would be an excellent way to commemorate the papal visit. He pulled four kegs of what would have eventually become a batch of the Iron Hill’s regular dubbel, catching it before Belgian candi sugar was added so it remained relatively low in alcohol. To personalize the brew, he decided to add yerba mate, since Pope Francis is rarely seen without a cup of this traditional Argentinean caffeinated beverage. Brewed from the leaves of a rainforest plant, mate is usually served unstrained and sipped through a metal straw, very similar to how beer was once drunk before brewers came up with the idea of lautering (removing the fermented grain). Pap-Ale will ring in at around 4.5% and should now be available at the brewpub. Pope Dennis The Phyrst Gose to Philly, Saucony Creek Brewing Co.
No subtlety here. Not wanting to miss out on the chance to have a pope-themed beer at the P.O.P.E. bar during Pope Francis’ visit, this brewery 50 miles northwest of the city is making its a gose and branding it appropriately. Bar owner Dennis Hewlett’s face graces the poster promoting the beer, which will be brewed in one 30-barrel batch. It’s brewmaster Nick Micio’s first go at the salty wheat beer style, and he’s been carefully culturing special yeast and bacteria to make it make it with. He may also add some grapefruit, though hasn’t yet made the final decision. What is known is that the beer will be ready to pour starting today. As-yet unnamed special firkin, Forest & Main Brewing Co. Brewers Gerard Olson and Daniel Endicott are also eager to join the P.O.P.E. bar/pope party, so they’re planning a special firkin to be offered at that location and on that weekend only (it won’t even be available at their own quaint brewpub in the suburban town of Ambler). The partners often say naming beers is one of the hardest things about brewing, and they haven’t yet been hit with papal inspiration for this one. The recipe is easier to pin down: A small saison will be lightly dry-hopped and then spiced with what Olson refers to as “Catholic” things, including wild grapes and myrrh. Editor’s Note: A previous version of this article listed Vault Brewing Papist Ale as one of the beers brewed specially for Pope Francis’ visit. A Vault beer called “Papist Ale” will be sold at the P.O.P.E. bar this week, but the beer is a renamed version of the Vault’s regular English IPA. A representative from the brewery did not make that clear to the author, and initially commented that Vault would officially register the name “Papist Ale” for the one-off IPA made for this occasion.